This old building is used by the church as their offices and daycare center. The beautiful vaulted ceiling with a wood plank ceiling is the main feature of the play area of the day care center. As you can imagine insulating this type of construction is not an easy task. This building was insulated on the exterior with 3” of perlite under the old shingles. This condition complicated the removal of the old shingle roofs because there is not a firm sub straight to facilitate prying the old shingles off and it forced us to use 4” roofing nails to attach the new shingles instead of the standard 1-1/4” nails. We also replaced all of the lead coated copper saddles, flashing and counterflashing then soldered all of the seams. 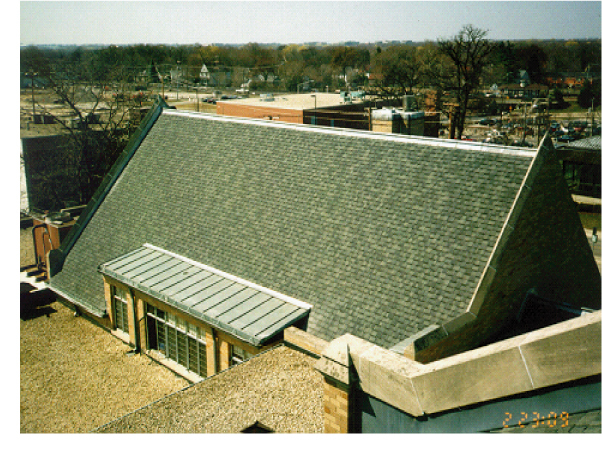 The new shingle is a 40-year laminated dimensional shingle manufactured by Owen Corning.